Dan Entah apa maksudnya Digby Pearson, Boss dari Earache Records ini untuk pertama kalinya coba merilis Album dalam format vinyl ini ( Bentuk sebagai Piringan hitam yang Kemudian menjadi khas dan menawan sebagai hasil dari bentuk biasa dan desain yang inovatif memiliki Bentuk Fisik yang lebih besar dari penerusnya ( 30 cm ) dan Keunggulan lain dari Format Klasik ini adalah menghindari Bentuk pembajakan dengan cara Reproduksi, apalagi hanya menuangkan 2 konten track yang sama namun oleh 2 band hehehe ( 1 Pembawa lagu asli, 1 Band yang Mencover ulang ) seperti mencoba cara klasik ini Earache Records coba menghadirkan kembali format yang masih digemari oleh beberapa fans pendengar musiknya. track pertama dimulai lebih dulu oleh Pioner Swedish Death Metal Populer, ENTOMBED yang mengambil materi " Drowned " ini dari Track Klasik sejak Band ini berevolusi awal dengan Nama Nihilist Tahun 1987 sebelum akhirnya menjadi Entombed Tahun 1989, yang ini sendiri adalah versi dari album pertama fenomenal sepanjang masa bagi perkembangan Swedish Death Metal Sound " Left Hand Path " Tahun 1990 via Earache Records masih begitu nyaring terdengar kekuatan dasyatnya walau hanya menjadi rekaman Klasik. Standing out from much of the death metal of the early 90's, before technicality became standard in the genre, many of the songs featured here have wild patterns of ascending and descending riffs, abrupt transitions, and a general tendency to not dwell in one place for too long. Sure, those things are shared by most death metal to one degree or another, but it's often done just for the sake of sounding crazy. Here, it's done with purpose. Everything on the record is done with purpose. For twenty-two years this album has stood up to all scrutiny it has ever faced. Not even one thing is out of place. kemudian track Ke-2 nya oleh EVILE, Youngest Thrasher Huddersfield, England, UK coba membawakan Track ini dengan masih begitu kuat Sound Khas Swedish-nya, padahal kita tau kalo band ini adalah Fans Berat-nya Metallica ! 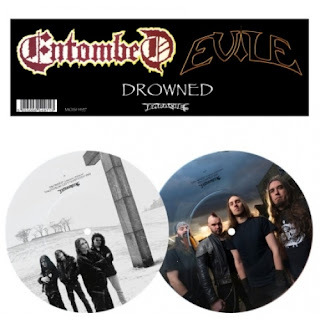 dengan aransemen yang ga begitu jauh mengalami Improvisasi ala Evile, " Drowned " ini masih tajam menusuk Karakternya, termasuk juga gaya bernyanyi Vokalis/Gitaris Matt Drake menjadi lebih Nge-growl khas ala L-G Petrov dan bukan James Hetfield hehehe .... ngomong2 ini seperti sebuah " Comparing Track " aja dan jadi sesuatu idealis bagi Digby pearson pribadi deh, orang suka atau Ga, yang penting menyenangkan bagi Seorang Dig kayaknya hehehe .... Without doubt one of the most important, respected, influential and downright amazing albums you will ever come across in the entirety of the death metal genre an astounding experience to listen to. Fully deserving of all the plaudits bestowed upon it, it is Entombed’s definitive masterwork, and all faithful warriors of the metal cause would do well to walk it’s dark track to see what hellish wonders are in store for them. And I wonder what he meant Digby Pearson, Earache Records Boss of this for the first time try to release the album in vinyl format (Form as LPs which then become distinctive and captivating as a result of regular shapes and innovative design has a larger physical form of successor (30 cm) and the other advantages of this classic format is a way to avoid piracy Shape Reproduction, let alone pour 2 content the same track, but by 2 bands hehehe (1 Bearer original song, one band that re mencover) as a way to try this classic Earache Records try to bring back the format is still favored by some fans of music listeners. tracks first started by the first pioneers Popular Swedish Death Metal, Entombed who took the material "Drowned" from Track Classic this band evolved since the beginning of the name Nihilist of 1987 before finally being Entombed 1989, which itself was a phenomenal version of the first album of all time for the development of Swedish Death Metal Sound "Left Hand Path" in 1990 via Earache Records was so loud sound power dasyatnya though only a classic recording. Standing out from much of the death metal of the early 90's, before technicality Became standard in the genre, many of the songs featured here have wild patterns of ascending and descending riffs, abrupt transitions, and a general tendency to not dwell in one place for too long. Sure, those things are shared by most death metal to one degree or another, but it's Often done just for the sake of sounding crazy. Here, it's done with purpose. Everything on the record is done with purpose. For twenty-two years this album has Stood up to all scrutiny it has ever faced. Not even one thing is out of place. then his 2nd track by EVILE, Youngest Thrasher Huddersfield, England, UK to try to bring this track is so powerful its Sound Typical Swedish, but we know if this band is Metallica Fans its weight? with the arrangements so far experienced Improvisation ga ala Evile, "Drowned" is still sharp stabbing character, as well as singing style vocalist / guitarist Matt Drake became more distinctive growl Nge-style LG Petrov and not James Hetfield hehehe .... ngomong2 this as a "Comparing Track" and so wrote something for Digby Pearson idealistic personal deh, people like it or Ga, which is important fun for A Dig seems hehehe .... Without doubt one of the most important , respected, Influential and downright amazing albums you will ever come across in the entirety of the death metal genre an astounding experience to listen to. Fully deserving of all the plaudits bestowed upon it, it is Entombed's definitive Masterwork, and all the faithful warriors of the cause metal would do well to walk it's dark Hellish track to see what wonders are in store for them.